It’s that time of year when the weather dominates council life. We have been out gritting for days (since Saturday morning to be precise) both priority road routes and pavements. By far the hardest job is gritting pavements, mainly because these have to be done manually. The council concentrates on priority areas for pavement gritting, for example outside schools, stations and clinics and, because they have to return to these areas often do not get around to many residential streets. To help residents 20 grit bins have been located in various places around the borough (the council don’t seem to have mapped them, so I have). The council’s website is hosting a cold weather update page that has the latest updates. The location data for this is now on my data page. Hey, where’s my grit bin? 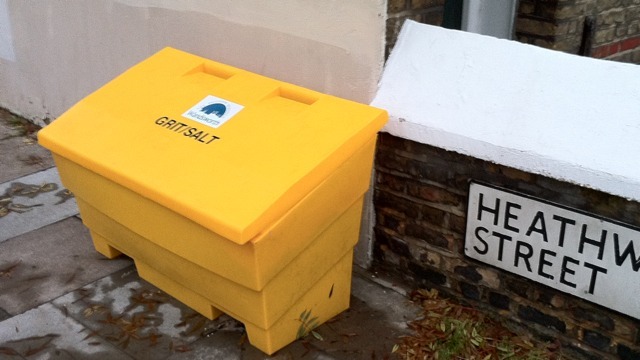 What was the logic behind the distribution of the grit bins? They are clustered around Southfields and Battersea while Putney, Roehampton and Tooting get one each? Three factors: hills, known problems, and low priority for the council. If you know the areas that have bins all are on hills and in areas that would not be treated as a priority zone for the council’s manual gritters. Tooting is much flatter and key areas get manual gritting by council staff. Of course, I’ve no doubt some will suggest some sort of anti-Tooting conspiracy! However… I think Wandsworth’s response to the cold weather has been very disappointing. 20 grit bins for the whole borough — that’s around one bin per 15,000 residents, or one for every 100 streets! Many areas have no bins at all. Likewise, Transport for London have done little or nothing to grit or clear snow and ice on busy roads such as Balham High Road and Bedford Hill. In Balham we have no bins, little or no gritting, and a majority of roads and pavements that are dangerous or impassable when there’s ice and snow. Older and disabled residents have difficulty driving or using the pavements, and many are unable to leave their homes at all. The cost to the economy is huge: from transport delays and cancellations, cancelled services and deliveries, injuries, car accidents, and so on. Conversely, salt is actually pretty cheap: around £20-£30 a tonne. UK infrastructure continues to dominated by institutions like the borough councils, TfL, BAA and National Rail with a bureaucratic ‘can’t do’ attitude. Residents are more than willing to help out and contribute — everyone I’ve spoken to would happily clear pavements and spread grit if it was available. We really need to sort this out — Wandsworth, get your act together!